Click on the image and check if it works. Now it works, thanks Javan! You are welcome Mike. 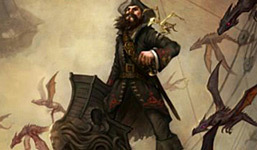 The link below the picture will take you to another page with more variety. good price but no canadian shipping. I didn't know that they were not shipping to Canada. Sorry for that. I don't live in the States either, seanv. 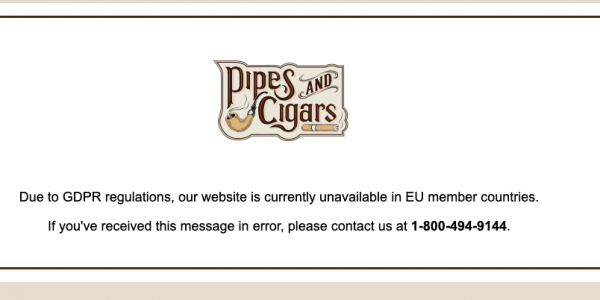 I use a forwarding company to get my pipes and tobacco from there. If my local B&M gave two shakes about pipes that would be nice. Dangit thanks so much Javan! Javan, thank you for sharing this! I needed a couple of knock around work pipes. $20 Stanwell is perfect. They come up $49.99 in my cart. I am curious as to how these prices will affect Stanwell's branding and estate market. All laws of marketing says that pricing their pipes this cheap is brand suicide. Bucket pipes in B&M's usually run about $40-50, which was already where their main product line was priced. Now, it just tells me that their briar and stems are sourced at bottom of the barrel prices. Many speculated that moving to Italy was the end of them. Having been the cutting edge of Danish design giving many pipemaker/artists their start, now they are merely the working man's pipes, priced amongst the Dr. Grabows, Kias, and Dollar Stores. This is usually not where a company usually wants their products to end up. Just speculating... but, if a company's direction today has an impact on the way we see their existing second market... it will be interesting to see how this all plays out on the value of the older Danish made pipes. Or even, how Dunhill removing their name from the current line of pipes affects the estate market for those. Not sure how the whole pipe retail game works yet but I figured maybe P&C is just trying to reduce inventory? They advertised these a few months ago at $49.95. Thinking they didn't sell well and they're trying to get rid of them? I didn't care for the way they looked but at $20 for work pipes it works for me. Looks like they're out of the brown and have the black for that price now. In my opinion, these are good pipes. I have several of these brushed finishes, and though they are not fancy, they are carefully produced and smoke well. I have several more of the Italian produced Stanwells and they all pass muster, after several years. Newbies building a pipe rotation would be wise to make this thrifty choice. 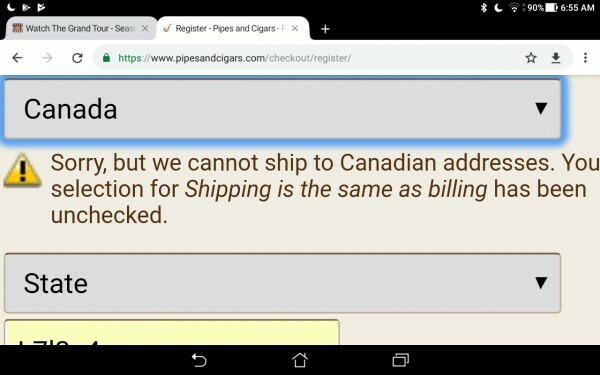 Now if smokingpipes offered something like this, us Canadians would be all over it. Yeah, I think the name of the game here is moving inventory at or near marginal cost. Most producers impose a minimum advertised price for items, and if retailers habitually go below that, they may find producers unwilling to do business with them, as it messes up the market for other retailers of the same item. P&C does crazy discounts on various things every so often, but you'll notice it's normally a private advertisement (emails to former customers, for example), rather than publicly posting that price on their website. This allows them to move inventory, keeps them from having trouble with producers/wholesalers, and is also good for the consumer(us). There was a thread touching on this a few months ago. The poster who seemed 'in the know' was a car salesman, and talked about how the dealership can go well below the advertised price for a car, but how it was death to a dealership to advertise the actual minimum price. @ Mso489,I have had some brushed Italian made Stanwells , and they wee exceptional, wonderful value,yet by this very day I haven't had no Stanwell that did not smoke well right off bat + stems both from acrylic and vulcanite on those were (and are)always most comfortable and buttons are well finished. Maybe just a matter of time before no one ships here. That all makes perfect sense. Thanks for an informative post. Hap, most likely true. I can see this. But, you've never seen Dunhills treated like this. You'd never see any more respected pipes being treated like this. This all makes it even more disturbing. They didn't even sell at under $50. One of the top ten pipe companies in the world, and many thought that was just too much? You see, this is where you can expect WalMart marketing strategy or Macy's. Walmart would put a big yellow happy face on it, and cut the price even more. Macy's would mark the price up, and move it even quicker. There is a strategy for making money, and then there is a strategy for just making it to the end of the week. This all doesn't look very good for Stanwell, IMO. In high end jewelry retail, if an item sets on the shelf for too long, it most likely is priced too cheap. They mark it up, and it will sell. It's counter intuitive to the layman, but it works. Heck, I can't even view their web page. Suppose it doesn't matter, I just got a new old estate that I'm very happy with. Still, this is an outstanding deal. Yup, had to do it. But I'm blaming jvnshr all the same. Bought one of the brown models last year and it has been a peach, no complaints at all. Smokes well. So, yeah, I bought a 190 this time around. I wouldn't think it as a company trying to get rid of some unsold pipes. I can assure you that those pipes cost more than $19.99. Obviously, they all have some minor cosmetic issues, fills, imperfections, etc. thus they are sold for a lower price but not for $19.99. This one is a marketing strategy that mostly cigar companies pursue once in a while (mostly before the summer); they would create a sampler or a 5-pack and sell it for a few bucks to attract new customers. The bonus is moving inventory. While moving the inventory is one goal, it's not the primary goal. The main point is to make money. This describes best what I wanted to say. I have been subscribed to P&C's email newsletter since 2015 and haven't received any email about this offer. A friend of mine who has subscribed recently received the email on the other hand. When buying from a supplier you are provided with the MSRP of the item and it is clearly stated that selling the item below that MSRP may cause you to lose the opportunity of selling it. Most of the suppliers won't pay attention to the price you are offering as far as they are able to sell their goods with the provided WSP (wholesale price) until someone complains. Check out the MSRP of the Zippo lighters and compare it to the prices of well-known Zippo sellers on ebay. Customers are happy, sellers are happy and Zippo is happy. These kind of offers mostly come from the suppliers and realized by the retailers. I don't think that in this case the retailer was doing it without the information of the supplier. I haven't seen the post of the gentleman about the car business, but he was probably right. All I want to say is official car dealers don't make much money on sales, even manufacturers don't earn as much as the governments earn from the custom duties and taxes. The motivations for car salesmen to make the sales at the end of the month due to quotas and such is very different than how most all other retail works. I wasn't necessarily blaming P&C as much as Stanwell. They were experiencing a slump in sales due to what they blamed on the cost of hiring workers in Denmark. So, the moved to Italy, where they can utilize cheap labor, then they price their products cheap. Their goal was to hit the cheap price points above driving their prices higher. You just don't see this with any other pipe company. And, I hate that it is Stanwell, because I liked their pipes. Cosmic, I don't entirely disagree with you, but it's not really an apples-to-apples comparison to compare Stanwell to Dunhill, any more than you should compare Timex to Rolex when looking at how price affects demand in the watch industry. Luxury goods occupy a completely different segment of the market (and consumers' psychology) than non-luxury items. Incidentally, my wife is a wedding photographer, and she gets more business each time she raises her rates, because people perceive her to be a higher quality photographer. Is she any better? Nope. But brides (presumably spending their dads' money on their wedding) see that she charges more than other photographers in the area, and think "she must be better, since she can get away with charging that much for some photos!" I bought 3 last year. I must admit they all smoke great. Best “new” pipe bang for your buck I’ve stumbled upon. I've heard nothing but good things about them. $20 beats the badly drilled Dunhills I've owned as well as the off center drilled Castello from another thread. Offering pipes like these would make me buy their higher grade pieces. I too can attest to the value of the Stanwell brushed series. I've had two in black that performed flawlessly and were great in hand. I thought so much of them that I gifted them to a couple of aspiring pipers. If I didn't already have more pipes than I will ever need, I would buy one of these. The bent's easily passed cleaners, the draws were nice and easy, and the lucite stems are impervious to oxidation. I have a few Danish made Stanwells that are pretty good smokers and have been curious to try the Italian made incarnations. I picked up five of these with no filter yesterday. Some to try and some to give away. Thanks for the heads up on the sale! When does this expire? When can i stop restraining myself? 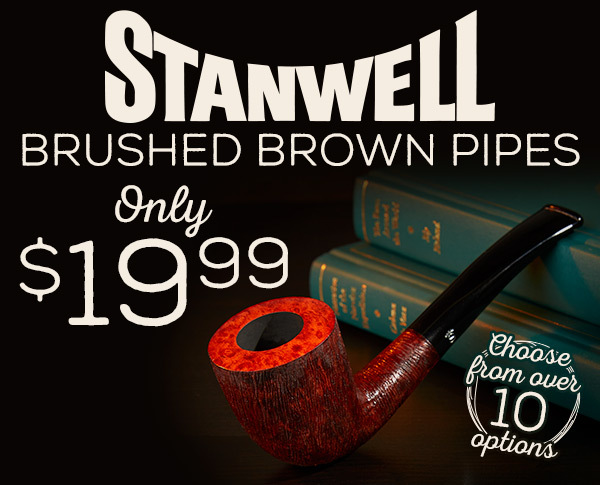 Stanwell pipes are every bit as good as their competitors, if not better. I see their competitors as Savinelli and Peterson mainly and I own several of all three brands. Stanwell offers the same quality as Peterson and Savinelli but for a better price point. I own 13 Stanwell’s now and all of them perform above par and some of them out perform most of my higher end pipes. The mechanics are perfect on all 13 of my pipes. Sure, some of them have fills but I would expect that for a pipe in that price range. Honestly, their prices are what have made me such a huge fan. It’s like Neerup Pipes, sure he could get away with charging a lot more for his pipes but he chooses not to and I absolutely respect that. As far as pushing the Brushed line so cheap, it appears that they are putting an end to that line of pipes and they are priced to sell. Edit* All of my Stanwell’s are from the Italian factory. People have warned me that the the bands will fall off or the pipe will disintegrate in my hand while smoking, it’s all hyperbole, they are quality pipes through and through. +1 for Hawky454, can't argue . I was going to buy a cutty but the shipping fee prevented me to do so. It is sold out now, thank you all who bought a cutty and ended my agony. It is sold out now, thank you all who bought a cutty and ended my agony. Enjoy it in good health, sir. Stanwell offers the same quality as Peterson and Savinelli but for a better price point. I would argue that they surpass Petersons and are on par with Savinelli. I actually got to talk with Peder Jeppesen when he was at The Briary years ago. He was doing what Walt Connoy is doing with Cardinal House. His one-of pipes were getting so expensive with people competitively running up the prices, that they set up a company to mass produce some interesting designs by them. "Mass Produce" being a very loose description of what they do. I agree with you Hawky, to a point. I just wonder if we will get any more "out of this world" designers coming out of Stanwell, like we have seen over many decades with them in the past. But, all in all, long live Stanwell. I really do hope this all works out for them. @jvnshr I literally bought the last one. I got around the shipping thing by buying 3 other models. TBH, I think the brushed finished is the least attractive and comfortable to hold of any finish. But for that price.... My "real" HCA cutty is possibly the best smoker I have. Got my Lovat in today. Very light, mediocre brushed finish is exactly as advertised, drilling looks spot-on and the draw is good. I'll probably smoke it tomorrow, but as of right now I think I'm going to get my $20 worth. Seems like the very definition of a worry-free smoking machine. And for less than some cobs you can get nowadays. I’m expecting three different shipments from 3 different vendors and all of them have been taking a long time to get here, I still haven’t received my P&C order, my Esterval’s order is in limbo and my Smoking Pipes order is showing that it’s still in NC. Could this be due to the cold front that’s hit a lot of our States? I just now saw this post and got all excited. The brushed brown is no longer offered. That's what I get for not reading the forum often enough. @tulsa...the brushed black are still available. At least a couple of hours ago. They ran out of brushed browns last year I think. Some of the brushed black are still available. My mind cannot comprehend how a any pipe can be offered at such a price and still be profitable. Knowing how much work it is to harvest briar, ship to to a mill, cure it, cut it, dry it and ship it to a factory in Western Europe which has fairly high labour costs where it gets cut and shaped, fitted with a stem and finished. Then put into a box, sent it to the states for it being sold for 20 dollars. A plant had to grow 60 years to be harvested and its product sells for a mere 20 dollars, it is quite unreal. Is there a code for this or is the deal over? That deal is long gone! These online retailer deals crop up but are always time specific, usually a few days, some a week or two. I've hit some real winners, for example a smokingpipes.com deal on Ser Jacopo, and more recently a great PC deal on unfinished Peterson, and before that a PC deal on Tsuge straight tapered billiard "tasting pipes" which were full size and full quality so far as I could see. But it's all opportunistic ... you have to move and do your deal. You snooze you lose, to quote that old cliche. I've really been enjoying my $20 Stanwells. Last year I bought a brushed brown and this year a black. They are fantastic no fuss smokers and are a substantial pipe for dirt cheap. You could spend a lot more for a much inferior basket pipe, so what's not to love??? Really. What's not to love? I ended up buying nice brand new pipes for very little money and have dedicated them to smoking Lakeland blends in good briars rather than cobs. Lakelands do ghost but who cares and IMO these blends really shine in a briar as opposed to a cob. Thank you, P&C and thank you, Stanwell. I too have a variety of the black brushed and can say they all smoke flawlessly. But that will be our little secret. I have to agree. Nice pipes. I bought four of them, two as gifts and two for myself. I dedicated one to Lakelands also. That's funny... I bought 4 and they are going to all be dedicated to lakelands. One specifically for 1792 flake.